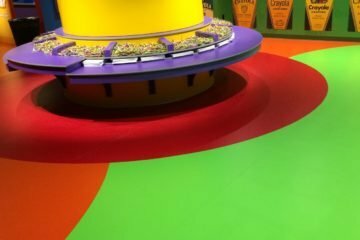 Crayola, best known for its iconic crayons and markers, recently expanded the brand’s Crayola Experience attraction to a third location. 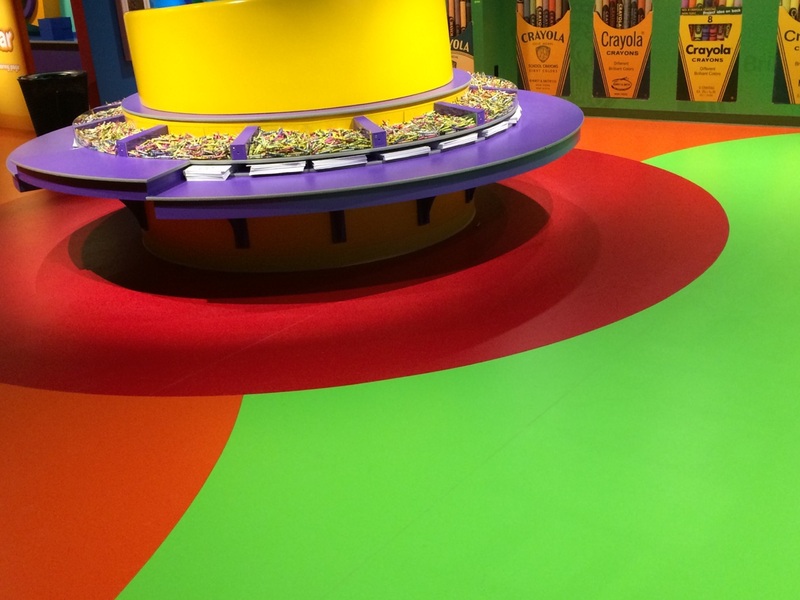 Located in the equally iconic Mall of America®, the newest location follows in the footsteps of the Crayola Experience in Easton, PA (the home of Crayola crayons since 1903) and Crayola Experience Orlando, and takes inspiration from the brand’s 1,500 proprietary products and technologies. 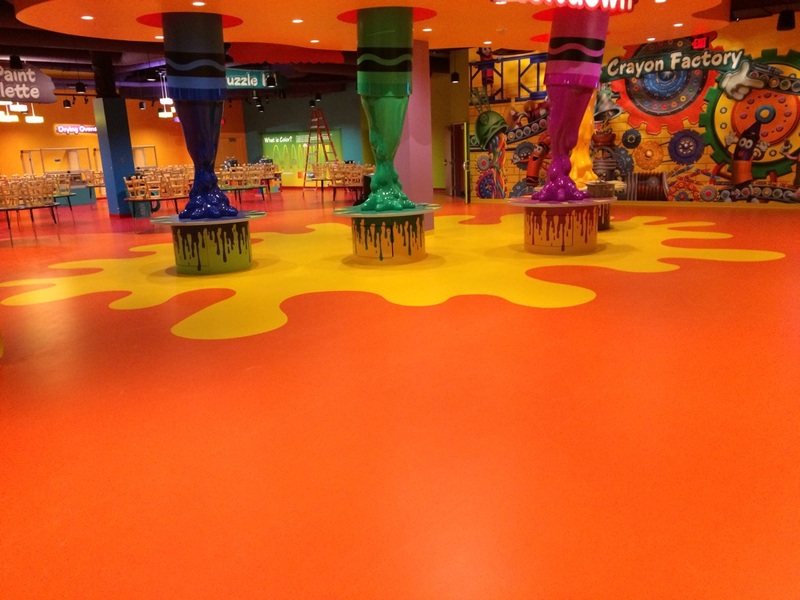 The completed attraction opened May 2016 and features 25 hands-on activities and live entertainment across 60,000 square-feet of colorful, unique rubber flooring from GerFloor and Tandus Centiva. 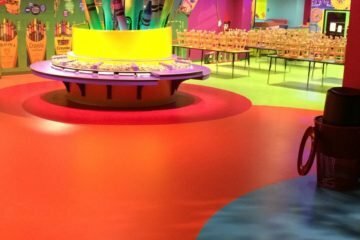 The story behind specifying and installing the flooring, which needed to withstand foot traffic of 250,000 – 400,000 guests, rolling load traffic, spills, flying crayons, markers and other stain-causing items, is as impressive as the finished attraction. General contractor PCL Construction approached Sonus Interiors, Inc. to install the flooring based on the company’s status as an INSTALL Warranty Contractor (with a 100% INSTALL certified workforce). As an INSTALL Warranty Contractor, Sonus team members have taken a variety of installation and training courses, and the company is in the process of sending all members to the INSTALL International Training Center in Las Vegas, NV to take the leadership course. CPL Construction also selected Sonus based on the mall’s unique installation challenges, which presented a number of issues throughout the construction process. 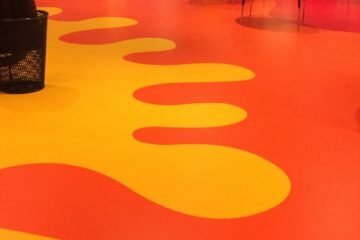 From uneven subfloors, to a complex installation that required intense heat welding of curved, custom-cut rubber flooring, Sonus was the ideal partner. 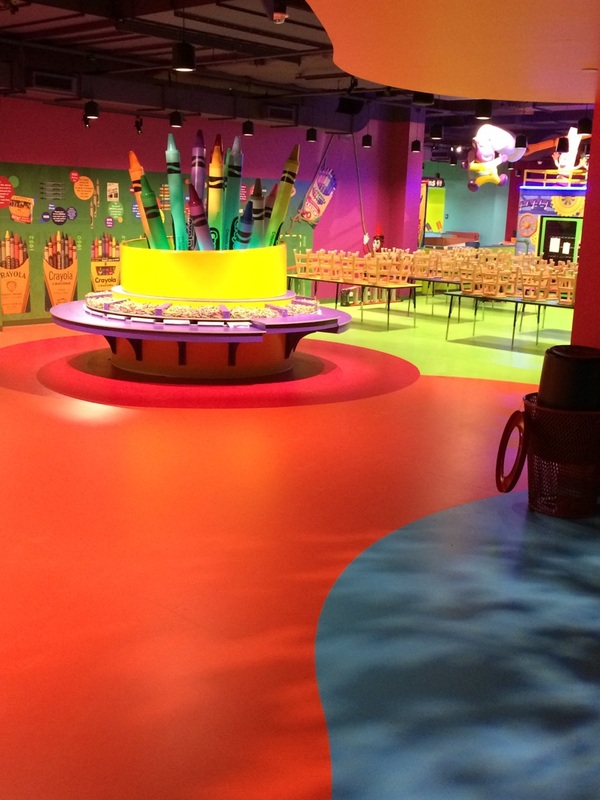 Ironically, the brand new Crayola Experience is located in the oldest part of the mall. What was once part of a corner pillar store (the original Bloomingdale’s) was emptied and stripped in anticipation of the build-out. The design called for a smooth subfloor and when the Sonus team arrived, they found an epoxy substrate under the original floor. 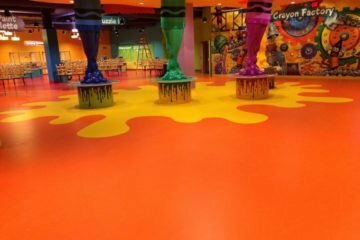 They quickly realized that they couldn’t install the floor directly over the epoxy, and recommended applying a topcoat to the entire floor with product from Shonox. Mall officials, however, recommended they remove the epoxy completely. As some areas of the epoxy were thick and others were thin, this was a time-consuming task and left Sonus with a shot-blasted floor requiring correction. After the subfloor was corrected, the team from Shonox was also able to write a job-specific warranty to guarantee the corrective substrate material. In addition to the installation challenges, the teams had to specify flooring material and finishes that protected against fading. Natural light, which enters through several skylights and windows, is prevalent in roughly 15-20% of the space. There are also projections that appear on the floor that necessitated additional protection. Another challenge was working around Crayola’s own fixturing team. The team from Sonus had to turn over spaces quickly, which were then exposed to heavy rolling loads, as large fixtures and branded items were brought in for installation. Yet another unique installation challenge came in the playground. Originally, a honeycombed rubber tile with high-strength glue was specified. However, this meant that the tiles couldn’t be pulled up to clean. 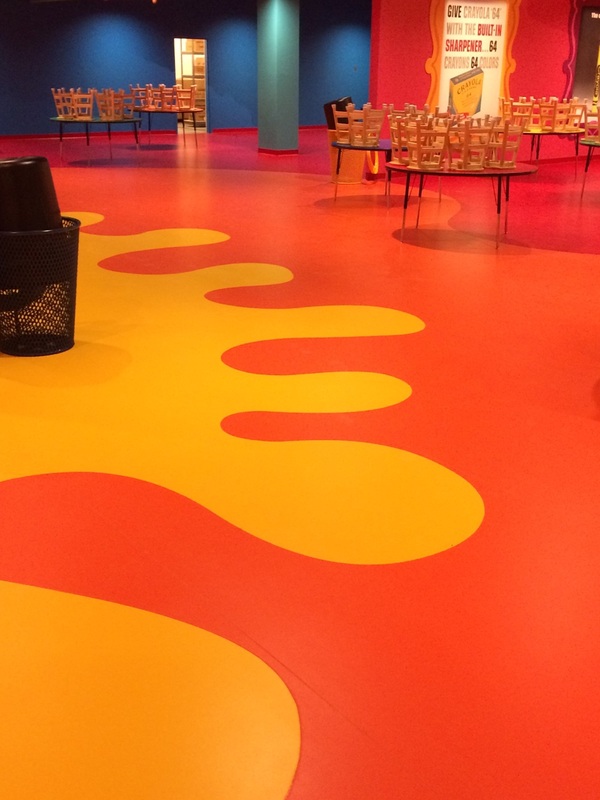 With thousands of children using the space every week, they altered the installation to a more interchangeable product better suited to cleaning and disinfecting needs. Due to manufacturing issues, Sonus had to charter a plane to deliver 39,000 square feet (almost the entire job) of GerFlor directly from France. This was no small tab but it kept everything on schedule. 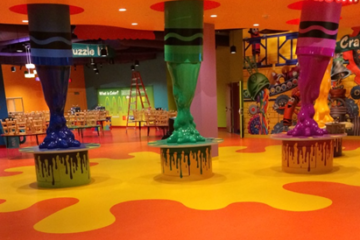 Three months and 1,600 man-hours later, the Crayola Experience at the Mall of America is finished and open to the public. “Overall, this was a challenging job. However, thanks to the experience of our INSTALL-certified installation team, open communication, and great partners in PCL Construction, Crayola, and Reztark Design Studio, the end result is something we can all be proud of,” said Jeff Rothi, vice president of Sonus Interiors, Inc.
All of the seams from color to color and through curves and radiuses line up perfectly. One seam will go all the way across multiple colors, with no visual distraction. This required additional material and time, but thanks to the easy communication with PCL Construction, they had the material, time and open areas to work with. “As the first INSTALL Warranty Contractor in the Twin Cities market, our training and communication experience helped the entire process come together. For a job of this scale, everything went as smoothly as possible,” he added.